We are spending the month of December in the Florida Keys and having the time of our lives. We were made to live at the beach. I mean, come on, have you seen our kids' hair? Random question: Have you made a 'bucket list'? You know, things you want to do before you die? I'm guessing swimming with dolphins is on there. If it's not, we're not friends. Since we all have a love of water and our kids (Adali especially) LOVE animals we knew that we wanted to find a spot where we could meet some friendly dolphins and maybe get a chance to swim with them. That’s when I found Dolphins Plus in Key Largo. Dolphins Plus has several different options for families who are wanting a dolphin experience. Since our kids are on the younger side we choose to do the Shallow Water Experience. We all suited up and got fitted for life jackets. Ada and Jax helped our instructor with the demonstration of what we would be doing with the dolphin. We learned a little about dolphins and how they swim, how they hear, what they eat. She did a great job including our kids in the conversation and letting them ask a whole bunch of questions. When the trainer was ready for us we all stepped out onto a platform and they lowered us into the water where we got to meet Hurlee and Ige. They were right, dolphins do feel like a wet hotdog! We got to introduce ourselves with a handshake. We checked out his teeth. Looked at his ears, which just looks like a tiny pin hole. We looked closely at his tale and the veins where they draw blood to make sure they’re all healthy. We all had such a great time meeting the dolphins that we couldn’t leave without giving him a goodbye kiss! He repaid us with a friendly splash. It was an incredible day. One that we will NEVER forget. The kids still tell me that they can’t believe they were able to kiss a dolphin and their eyes still light up when they talk about our day with Ige and Hurlee. Dolphins Plus also works with special needs children, terminally ill patients, disabled veterans, disabled SCUBA divers and the elderly. They even have a program called Oma’s Cancer Patient Program to help foster hope and minimize stress. I think it is just amazing they different ways they are giving back to their community. They aren’t just a business, they're like your family. They have a “Trainer for a Day” program that Adali and Jett would have loved to do. Maybe next time we are in the Keys we will figure out a way for both of them to participate in that program. What a great hands-on experience for kids to have. It’s safe to say that the Dolphins Plus experience was THE HIGHLIGHT of our whole stay in the Florida Keys. 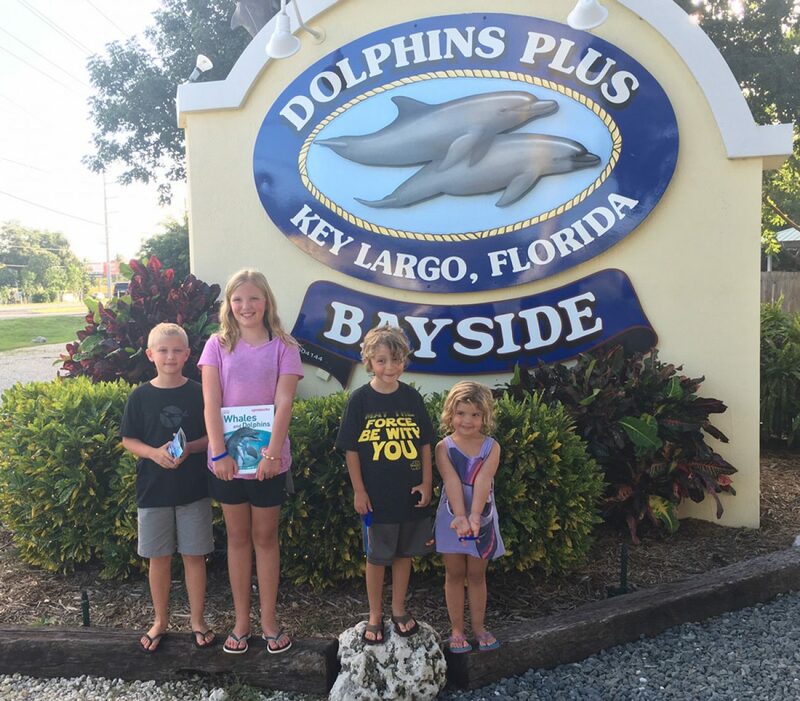 If your family is planning a stay in the Keys, make sure you check out Dolphins Plus in Key Largo. They have two locations to choose from, Bayside and Oceanside. While this was an absolutely amazing experience, it's not cheap! I do wish they had some sort of a 'Family Dolphin Experience' instead of having to pay per person. When you have 4 kids (or more) $165/person adds up quick. Even though it's pricey, we were really blown away by the quality of the time we got to spend with the dolphins. They don't give you a set time, but make sure that each person in your group gets to do the dolphin activities. Once Ige decided he was done for a bit and took off for a swim. They don't rush them and wait until they're ready to go again. This shows a great respect for the animals and ensures you get what you pay for. Thank you Dolphins Plus for making one of our family dreams come true!